Do you have a patio, lawn, or backyard? Do you tend to wait too long to get it into shape before spring comes? We've been there. Those panicked, last-minute preparations before your friends or family arrive. You realize you should've replaced that chair with the peeling ceramic two years ago, and your 8-seater table has been beaten into a flea market item by the winter's cold and rain. That's why today, while there's still time, and we're still in early March, we want to quickly highlight the top 5 outdoor furniture trends for 2017 that will help you purchase the right pieces to create that perfectly serene and inviting outdoor experience - before the doorbell rings. The spaces below, featuring furniture by Bivaq, are examples of trending contemporary furniture with clean lines and no-fuss designs for an eye-pleasing experience. The pictures speak volumes, so we've kept the copy short. Simple is easy. Simple is inviting. Simple means, "I'm not trying too hard to impress you, and that's exactly why I'm impressing you." When you open a space, you ask a question. We are seeing an increase in teak furniture. Teak is strong, durable, fun, and sleek. Hard to find a type of wood that checks all those boxes. We use a similar version of it, iroko wood, for its durability and resistance to both rot and insect attacks. Indulge below. Bigger isn't necessarily always better, but the trend this year will be bigger outdoor tables to entertain a larger number of guests. 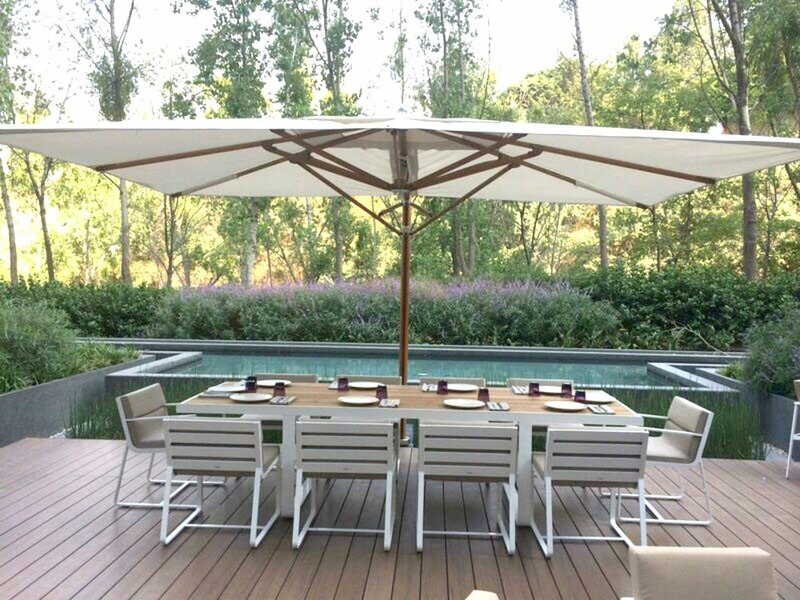 We're seeing outdoor dining tables now seating 8 or 10 people easily for that comfortable al-fresco dining experience during the warmer months. Your patio or backyard should be an extension of your home. Blend both areas with the same style and watch indoors become outoors and outdoors become indoors. After all - you kind of want both at the same time, right? A sofa, armchairs, ottomans that can be used both as tables and for extra sitting. Different options to accommodate the crowds and people's seating preferences.